Tracking carbohydrates helps people with diabetes keep their blood sugar balanced. It's also a good way for anyone who wants to watch his carb intake, whether to lose weight, consume the right amount or even to carbohydrate load before an endurance activity. Counting carbohydrates isn't hard, but it does take a little time and can get tricky with pasta due to different sizes, shapes and ingredients. Before you begin counting, decide how many carbs you'll consume at every meal and snack. Having an intake goal is the only way to know whether the carbs you count fall short, exceed or meet the amount you should consume. If you're diabetic, consult your health care provider or dietitian to set carb goals. Others can use Institute of Medicine recommendations to get 45 to 65 percent of their daily calories from carbs. Next, determine your serving size and check the nutrition facts label for the number of carbs in every item you plan to eat or drink. Add them together for each meal to see if they match your goal. The only way to be precise about your portion is to measure the pasta. You can do this after the pasta is cooked or, if you don't want to cook more pasta than you need, you can also measure the dry pasta before tossing it into the cooking water. Some brands put the amount of dry pasta to yield the cooked serving size on the nutrition label. As a general guideline, 1/2 cup of dry elbows or rotini yields about 1 cup cooked. About 2 inches around the outer circumference of a handful of spaghetti or other long-shaped pasta becomes 1 cup when it's cooked. Serving sizes stated on the nutrition label range from 1 cup to 1.5 cups of cooked pasta. Since the carbs reported are for the serving size defined on the label, you may need to adjust them if you consume a different portion. Also be aware that the portions on the label, and the amount often enjoyed at a meal, are larger than the 1/2-cup serving recommended by the U.S. Department of Agriculture. 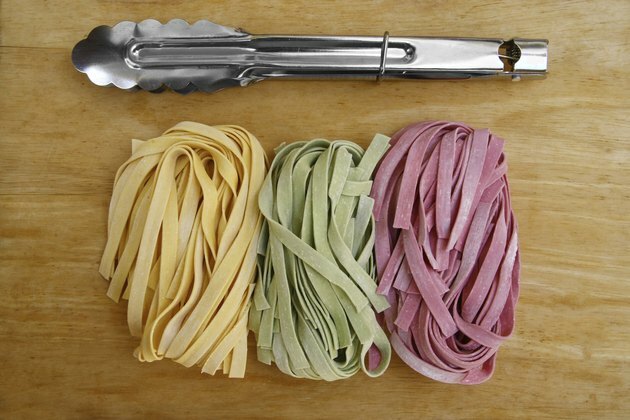 Expect 1/2 cup of cooked pasta to have 18 to 22 grams of total carbohydrates, depending on the brand and ingredients. For example, 1/2 cup of whole-wheat spaghetti has 19 grams, while the same portion of plain spaghetti has 22 grams. The nutrition panel reports the amount of total carbohydrates, sugar and fiber. Some products also carry statements about net carbs or effective carbs. Net carbs are calculated by subtracting dietary fiber and sugar alcohols from the total carbohydrates. However, sugar alcohols and some types of fiber have a small impact on blood sugar and should not be ignored, according to a report from Kansas State University. You can subtract insoluble fiber from the total carbs if it's reported on the label, otherwise the American Diabetic Association recommends using the amount of total carbohydrates. Kansas State University: Nutrition News: Net Carbs, Impact Carbs, Zero Carbs That Count – What Does It Mean? Can Diabetics Eat Semolina Flour?